Your business is important to you and you want to do everything you can to ensure it has a bright future. Any discussion about the future of your business must include the topic of succession planning and business transfer. It’s a vital part of any business, especially when you consider that 83% of SME owners think it’ll take less than three years to transfer their business when it reality, it takes an average of seven years  . Here are few avenues of reflection to help you approach this important stage of your life. By taking stock of your situation. Your age; the kind of business you operate and your field of activities, your professional entourage who support you such as family members who work with you, key employees you can count on, the number of years you want to spend on the transfer; your career plan once you transfer your business (retirement, acting as a consultant, new projects…), etc. These are all elements you need to take into account when planning for the future of your company. How do you begin the transfer process? The sooner the better. Planning is the key to a successful transfer. Financial and tax aspects are issues that entrepreneurs usually thoroughly understand. The succession plan. An essential document to outline the human, strategic, tax, legal, and financial aspects of your transfer. Communication, both internal and external. It’s how you maintain trust in the relationship with your employees, close entourage, and business partners for a smooth transfer! Who the new leaders will be. If you’ve identified them, you need to gauge their interest in taking over your company, and make sure they are competent enough to do so. 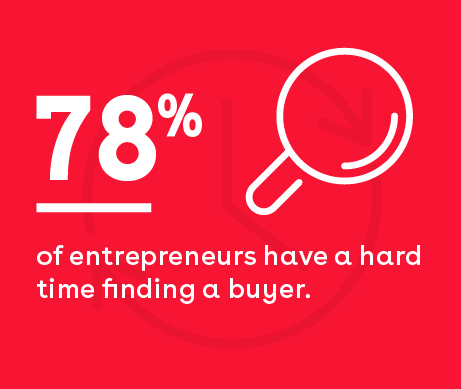 78% of entrepreneurs have a hard time finding a buyer . Think your daughter or son is the perfect person to take over the company? Did you know that’s what 60% of transferors think? 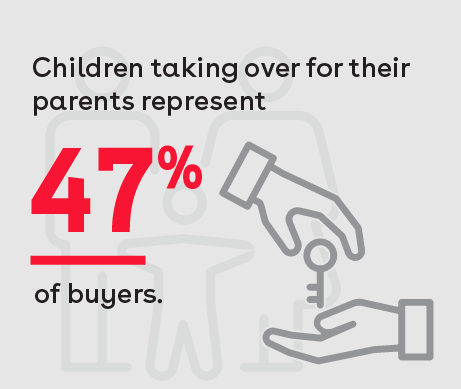 Children taking over for their parents represent 47% of buyers . Knowledge of your company’s market value. Less than 60% of entrepreneurs aged 55 and over who want to sell know the fair market value of their company . A transfer includes an emotional component. Letting go of your company often involves an experience similar to mourning. You need to be aware of this to prepare for this period. Are you interested in a business transfer? You can now complete the business transfer diagnosis that will help you understand what you are prepared for and what you should improve. In closing, know that you are not alone: there are several specialized resources that can support you in this process, such as the Centre de transfert d’entreprise du Québec, expert advisors at Raymond Chabot Grant Thornton, your tax advisor, your bank advisor, etc. CCMM. Transferring businesses to the succession: a major issue for the Québec economy and the sustainability of SMEs, 2014. Key strategies for a successful business transfer! The Chamber presents strategies and issues related to successful business transfers.